Yesterday, Ropes & Gray, the law firm commissioned by the USOC to investigate the various institutional and individual failures that enabled Larry Nassar to abuse hundreds of gymnasts for decades, issued a report on their findings . The biggest revelation—that Alan Ashley, chief of sports performance, was notified in 2015 about Nassar and failed to act—was widely reported on yesterday, and Ashely was fired by the USOC as the report was made public. While free of other major bombshells, though, the report fleshed a lot of what had already been reported over the last two years. Here are some of the most interesting—and disturbing—anecdotes in the 252 page report. The report includes an email from Rachel Brazo, the director of program administration at USA Gymnastics. In the message, Brazo is clearly upset that she and other staff members had not been informed about the allegations and feels that she inadvertently put athletes in harm’s way because she wasn’t made aware. Writing before the reporting established the exact timeline for notification of USA Gymnastics officials and authorities, Brazo states, “I am not sure of the timing when we first learned about these allegations against N[assar] but I am sure it wasn’t yesterday.” Brazo goes on to say that she had been managing USA Gymnastics’ healthcare referral network for many years and, she writes, “This morning, I removed N[assar] from the referral list on our website, not because anyone told me to but because it’s my job and my responsibility.” Nassar was also on the Referral Network review board and had recommended several of the doctors who were on the list; he was only removed because of Brazo’s initiative, not because a higher-up instructed her to do so. Steve Penny and highers-up at USA Gymnastics were so preoccupied with keeping the allegations secret that they allowed Nassar’s name to stay up on the doctor referral list even after they had received several credible allegations against him and had reported him to the authorities. In slides that he presented to rationalize his “treatments,” Nassar borrows from the opening-credits language of Star Trek. While I have seen some reporting on this particular slide and its reference to Star Trek, this is the longest—and most disturbing—version of the text I have come across. Back in September 2015, then-USA Gymnastics president Steve Penny emailed Ashley and then-USOC CEO Scott Blackmun and Ashley about Nassar, using the doctor’s name in the communication. When the investigators came calling, the email had mysteriously disappeared from both Blackmun’s and Ashley’s inboxes. Specifically, having registered its significance, Mr. Blackmun stated in his interview that he may have purposely deleted the September 8, 2015 email, noting its sensitivity and explaining that he was concerned about the potential for his email account to be hacked. In this regard, he stated that he had been apprised by an IOC official that a Russian hacking group, Fancy Bear, had infiltrated the IOC’s email system. According to Mr. Blackmun, the IOC official cautioned him that the USOC’s email system could similarly be vulnerable. Mr. Blackmun did not recall when this conversation with the IOC official took place in relation to his receipt or deletion of the September 8, 2015 email. Do they award gold medals for “weakest excuse to hide a coverup and mask institutional corruption” at the Olympics? I think Blackmun would be a shoo-in to win that title. First of all, he says that there were never any complaints made against him, which is a flat-out lie. By 2015, he was aware of several complaints, including an allegation made by Brianne Randall-Gay to the Meridian Township Police Department in 2004 and the MSU Title IX and police investigation from 2014. Those, though, are just the two with an extensive paper trail. 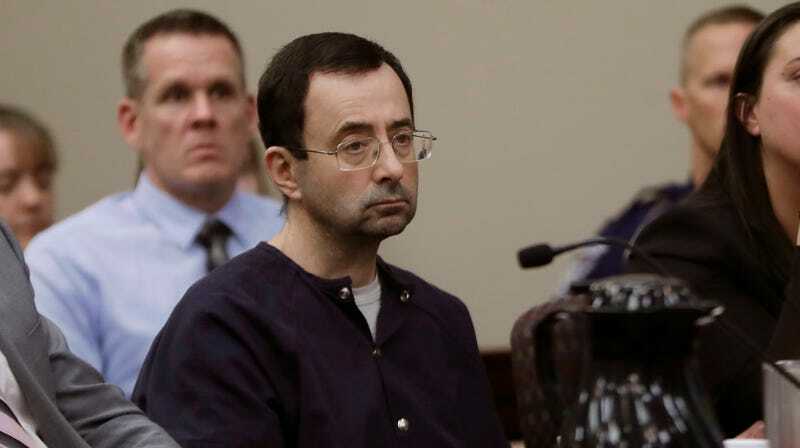 The earliest complaint made against him dates to 1997 when Larissa Boyce told then MSU gymnastics team coach Kathie Klages that Nassar had molested her during a medical appointment. I have been training 2 female doctors to take my place, Dr. Green and Dr. Lemmen. I do not want to place another male in the same situation I have had to deal with for so long. If 2015 really was the first time that Nassar had been accused of sexual misconduct, as he claims, then why would he make this comment about training women as his replacement because of having to deal with something presumably involving suspicion of wrongdoing or ill intent? I don’t want to become that ‘old doc’ that lost his touch. He also talks about the difficulty of treating athletes when they are outside of proper examination rooms and away from their parents. As we now know, Nassar abused patients in proper medical facilities and with parents present. So, the NRA was an NGB, and was decertified in 1994. (The other unlucky NGB was the U.S. Handball Team Federation, which lost its status in 2006.) This is not the most important bit of information, but it is interesting. “In the late 1980s, a George Steinbrenner-led committee issued a report recommending that the USOC reduce the number of committees to 13 from close to 30,” the report states. This had the effect of making grassroots organization and athlete participation in institutional governance less of a factor, making the USOC more of a top-down, corporate operation. Before this move, athletes had a much larger say in governance. Not exactly surprising that Steinbrenner would recommend something like this. In 2011, the Karolyi Ranch became an official “Olympic Training Site.” While this didn’t mean that the USOC would be running the joint—it only directly oversees its training centers in Colorado Springs and Lake Placid—you’d assume that the designation would mean more than simply affixing the Olympic rings to the Ranch. After the 2012 Olympics, the USOC’s medical team was asked to evaluate the medical staff that the various NGBs brought with them to the Games and Nassar “received low marks and a recommendation that the USOC not invite him to future Games based on his inability to work well in a multi-sport 154 environment.” But Dr. Bill Moreau, the vice president of sports medicine at the USOC, told investigators that this negative evaluation probably wouldn’t have kept Nassar from being credentialed for the next Games, that the medical personnel that the NGB chose for itself would be credentialed. To prove his point, Moreau said he tried to exclude a medical practitioner chosen by a national governing body who believed in quackery like athletes should be treated on a “magnet bed.” He was ultimately overruled and the magnet bed guy, who probably received his sports medicine training from Tom Brady’s guru, was credentialed. Nassar would’ve been credentialed for Rio had Maggie Nichols, McKayla Maroney, Aly Raisman, and others not stopped him. It was their work, not any enforcement by the USOC, that prevented him from “treating” athletes at the most recent Games. We are continuing to scrutinize this report, and this post will be updated.